Waterfront Splendour is a 60sq luxury waterfront home catering for families and groups requiring only the best on offer for their holiday or business trip away. It offers everything you need for a 5 star holiday and includes luxurious fixtures and furnishings. 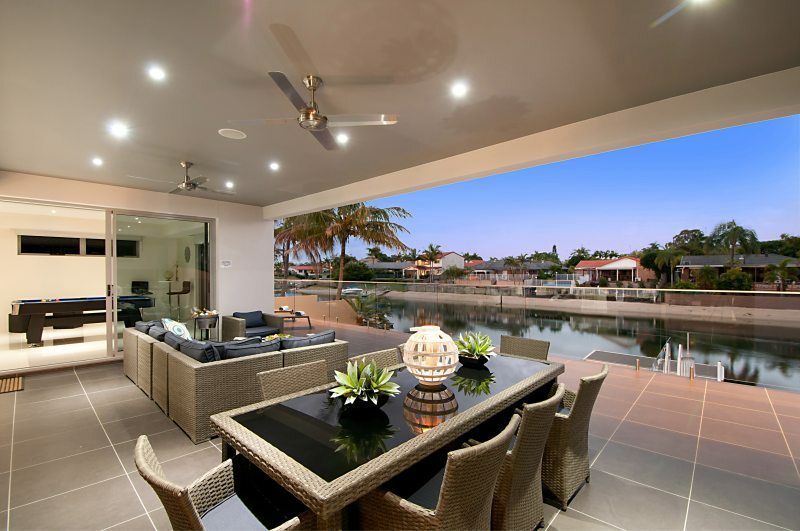 This contemporary north facing home has been thoughtfully designed maximising waterfront living and ensuring a holiday experience guests will never forget. There is clever mix of style and sophistication throughout this 5 star property whilst still ensuring that you can truly relax, unwind and feel comfortable in your surroundings. 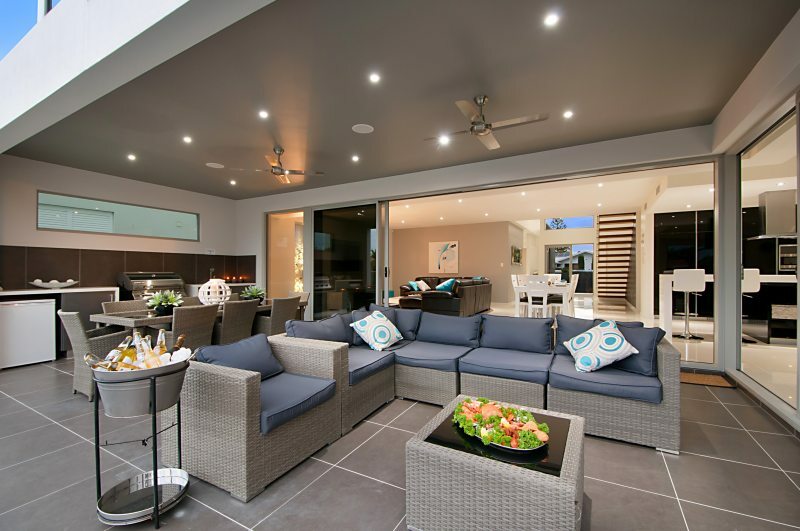 The house is designed around the waterfront with the huge open plan living, dining and designer kitchen all flowing out to the oversized alfresco dining area, pool and onto the waterfront. With a pool table, Cinema room, pontoon and sandy beach there is plenty to keep you occupied when you are not lazing around the sparkling pool. The home is fully air-conditioned for your comfort, is equipped with an iPod docking sound system, and has Cable TV, and Playstation 3. For those that can’t bear to be without their gadgets on holiday or are travelling for business the home offers free internet. This designer kitchen features Miele appliances and an induction cooktop. 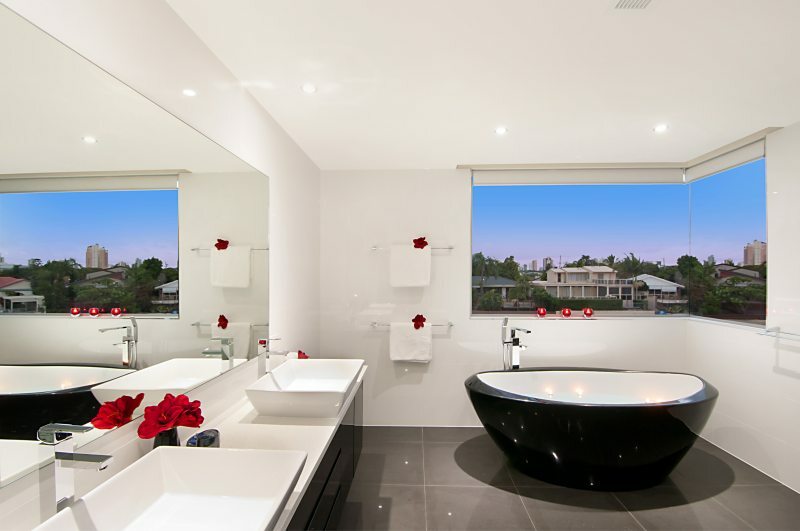 The sleek design is an entertainer’s delight and includes a Nespresso Machine. 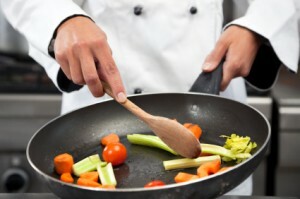 Cook up a own storm or you may like to use the services of the Personal Chef to cater in style. 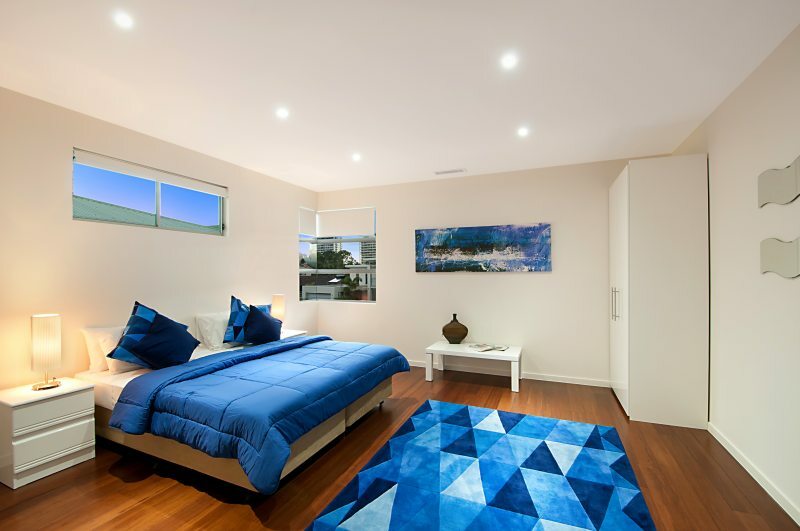 The spacious master suite on the second level is simply stunning and is complimented by beautiful city skyline views from the private balcony. 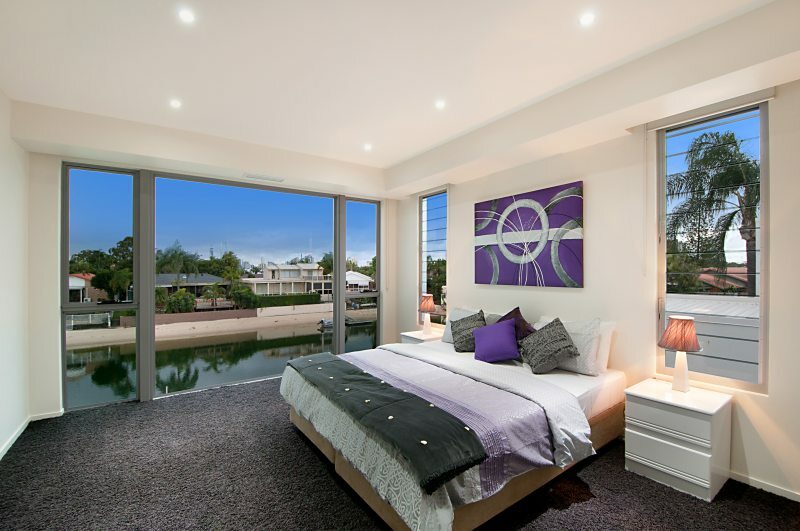 This master suite has an enormous ensuite and walk-in-robe. 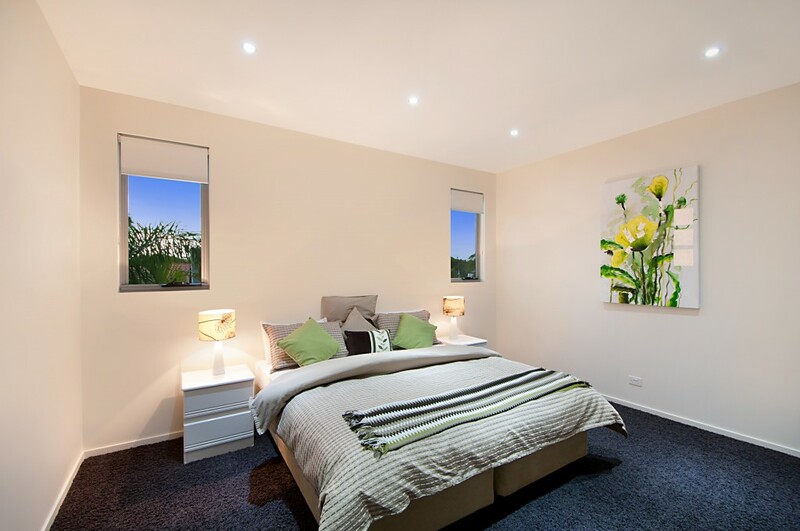 There are a further four bedrooms on this level, two with an ensuite and another full bathroom. A second master suite downstairs also has a large ensuite and walk- in- robe. There is another bedroom downstairs and a powder room. The kids will love their stay. They will be kept entertained with the waterfront activities such as fishing sandcastle making or feeding the ducks. 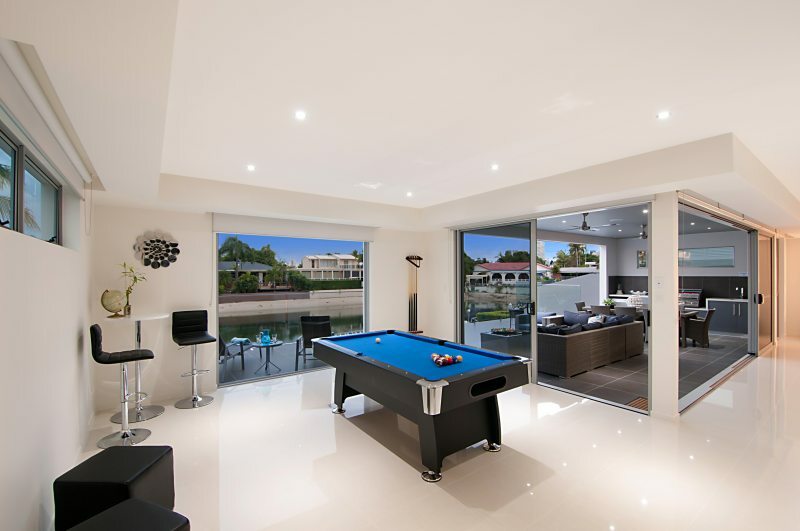 Inside they have their own cinema to watch movies and Foxtel or play games on the PlayStation 3 and they can hone their skills on the pool table if the adults haven’t taken over! The pool and waterfront are fenced. If this property does not meet your needs or is booked please advise us as we have other properties that we can also recommend. A lovely sandy beach with your own pontoon to tie your boat to or fish from. The seven spacious bedrooms, four bathrooms and powder room effortlessly cater for large groups or families holidaying together. There is a 2 car garage and secure parking for an additional 2 cars on the property. 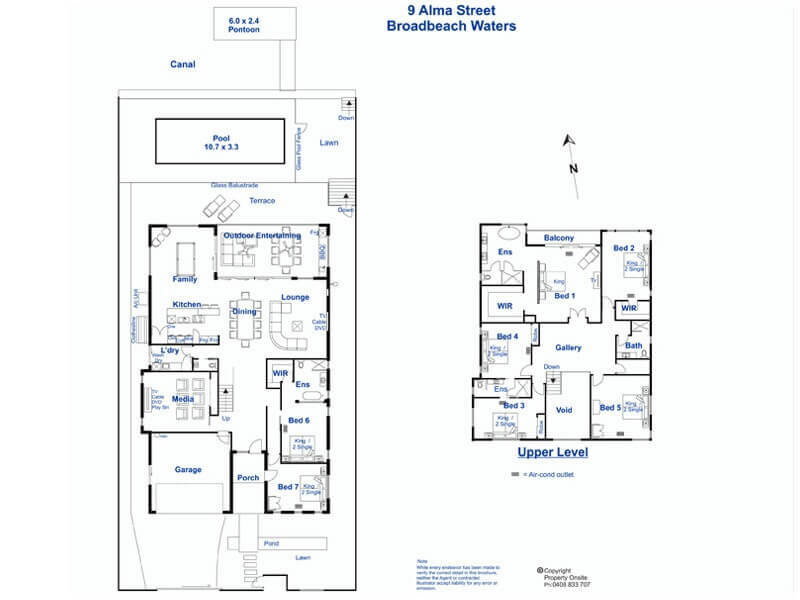 Property has 13 beds and can sleep a maximum 14 people. The house was all it should be. Staff were there on call helping and sending update information. I found the property clean and easy to navigate . The open plan was fantastic with the winter sun shine either on one side or the other warming just enough to make use of the opened area . This was our second year booking a property through Elite and we couldn’t recommend them more highly. Angie, Kylie and the team are awesome to deal with and make the whole process easy. 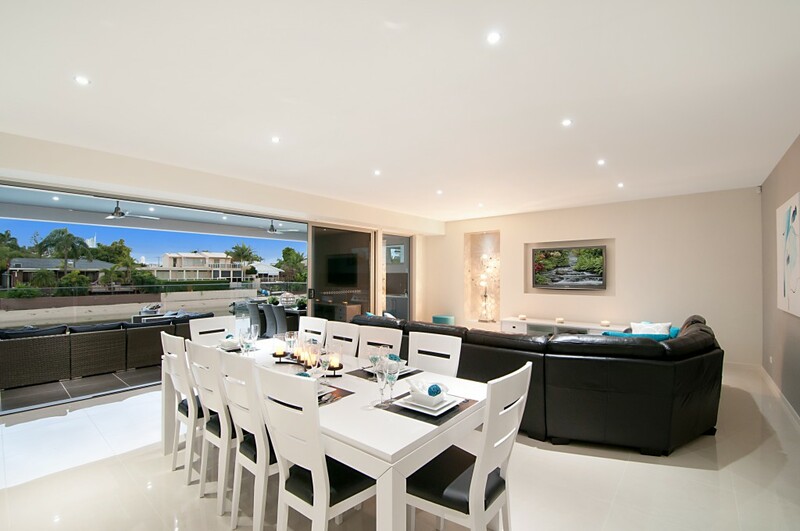 Waterfront Splendour is an outstanding property with ample space for a number of families with kids to stay. We didn’t feel crowded and the media room / concert theatre was a hit with the kids! “The Best of the Best. Not only was property great, but also the staff were so professional and friendly. 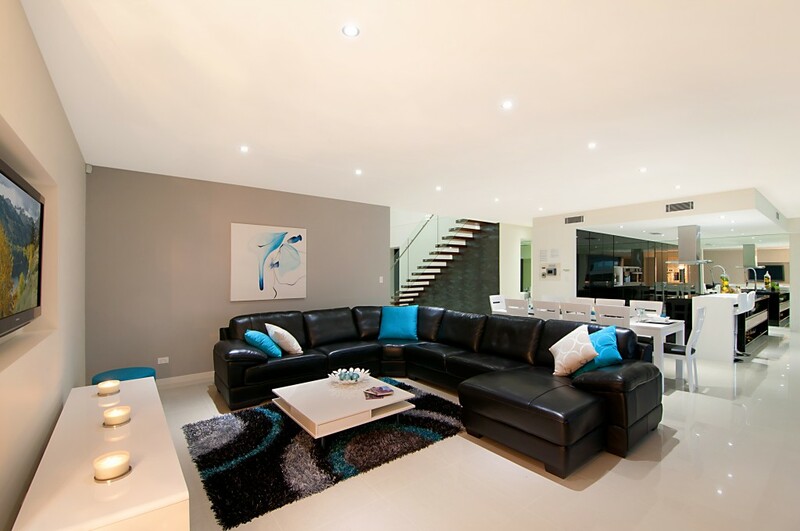 Property was perfect for adults group and great entertainment structured house. Thank you very much for your great hospitality!! 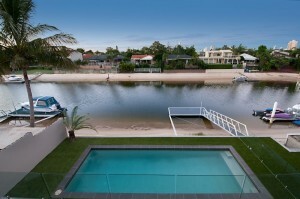 “Waterfront Splendour – The Name says it all!. I took a group of 10 on a golfing holiday. 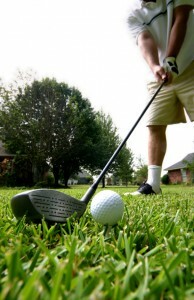 The property is not only impeccable in every way, but is close to everywhere that you want to go to on the Gold Coast. I would thoroughly recommend it to all families, groups and friends. Truly a Magnificent property. “What a Gem. Definitely had the wow factor! Everything we needed was there. No reason to leave the house or the pool 🙂 Very clean, and kitchen well equipped. Loved the led lights in the shower too. Walking distance to pacific fair for all pampering and shopping needs. Outstanding House. This was an unbelievable stay for us girls. Perfect for the 14 of us, made life very easy and relaxing for all after many games of netball. “GREAT HOUSE. LOVED IT , IT HAS EVERYTHING A FAMILY NEEDS TO STAY ENTERTAINED . 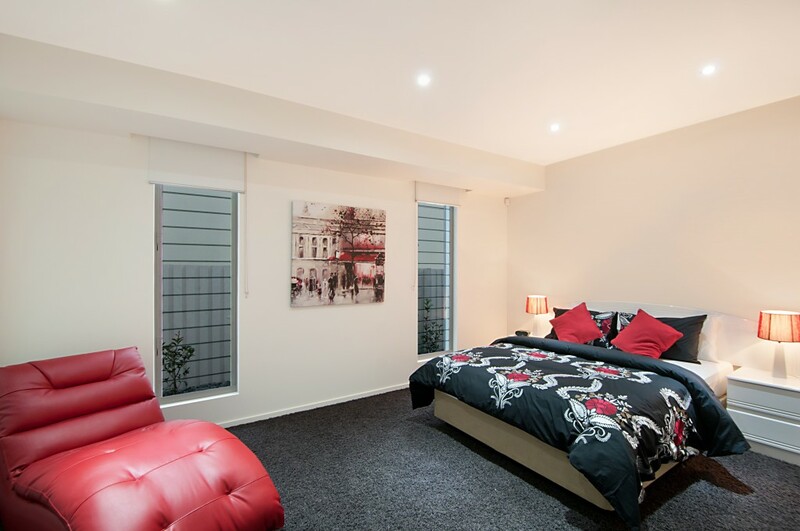 “We stayed at this accommodation for approx. 1 week. We were intially worried that the photos wouldn’t be a great illustration of the property but we were stunned upon arrival. It was beautiful. The house was clean and everything was available to our comfort. We really did feel at home and didn’t want to leave. Thank you to Elite holiday homes for making our holiday amazing!! Will definitely be coming back. “Fantastic Property” – This property was in a great location, close to shopping centre etc It was well presented and very clean and tidy. thank you for a great weekend. “Waterfront spectacular!” – I had an amazing stay with my girlfriends at this house. The location was fantastic, easy walking distance to everywhere – Broadbeach restaurants and shops, Pacific Fair and what I thought was the best breakfast place in Australia – Grocer and Grind. 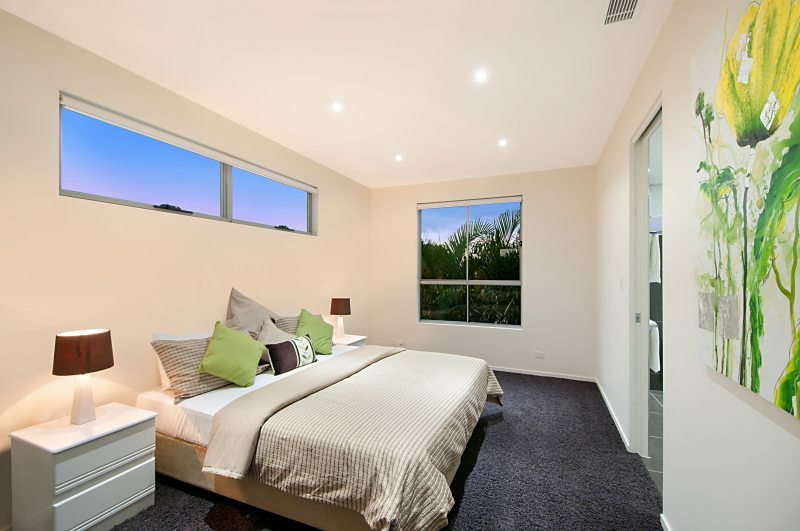 The bedrooms were spacious, the kitchen well equipped and the outdoor area sensational. The pool table was fun too. We felt like Queens 🙂 Highly recommended. 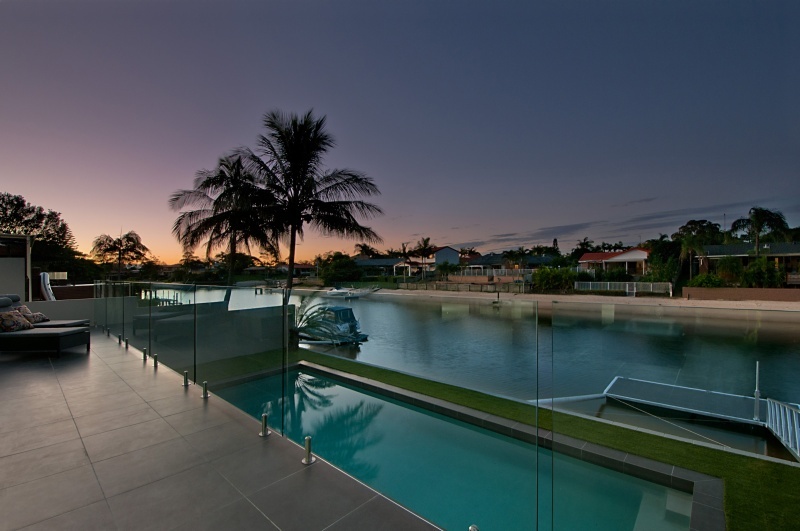 “Faultless house” – We have stayed at a few ‘waters’ houses on the Gold Coast and this bar far was the best ticking all the boxes. Elite holiday homes always a pleasure to deal with. “Spectacular house.” I really enjoyed every moment of the house, and cannot wait to book my another trip in January again. “Great holiday location” We thoroughly enjoyed our stay at this property in Jan 2016. There was plenty of space for all our family, the outside BBQ area was excellent, and we used it every night. The rooms were spacious and well appointed. The media room was a bonus and was enjoyed by all. The property gave us privacy yet was located within easy reach of shopping and restaurants. 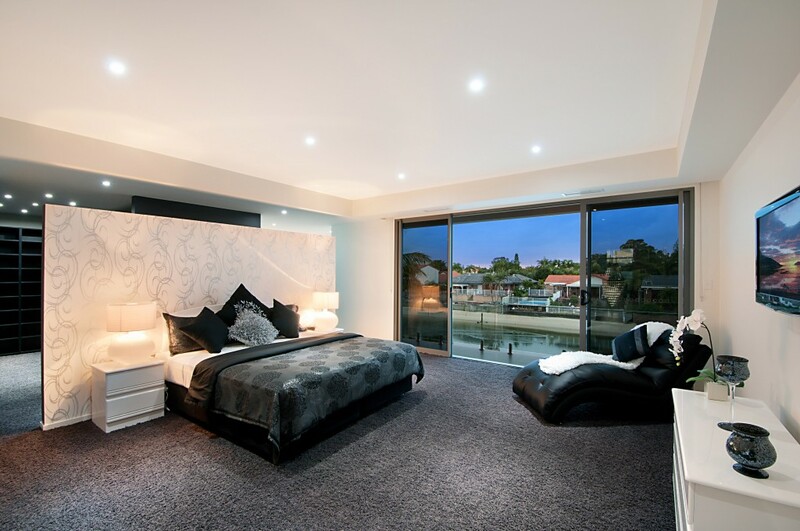 “Fantastic Waterfront” We thoroughly enjoyed our stay at Waterfront Splendour . It ticked all the boxes for a fantastic family holiday . Exceeded expectation.We had no need to leave the house, the pool was so warm & inviting, we used the outdoor area everyday & night. 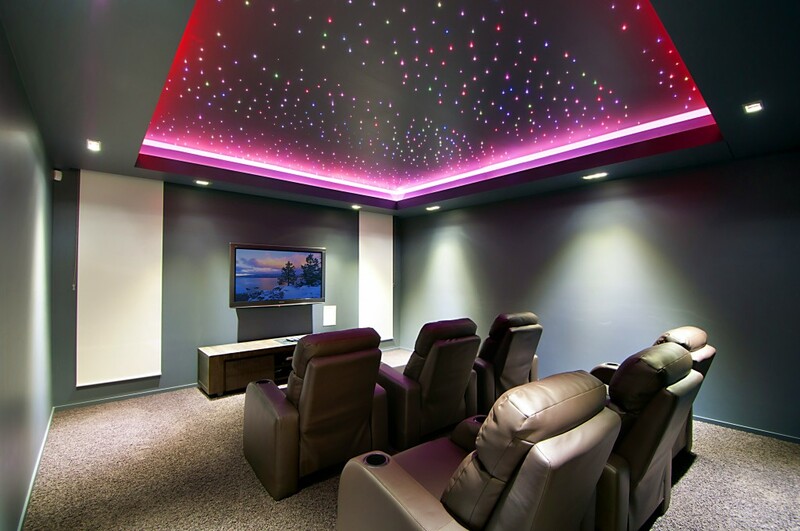 Theatre room was fabulous. It was sheer luxury & we didn’t want to leave. 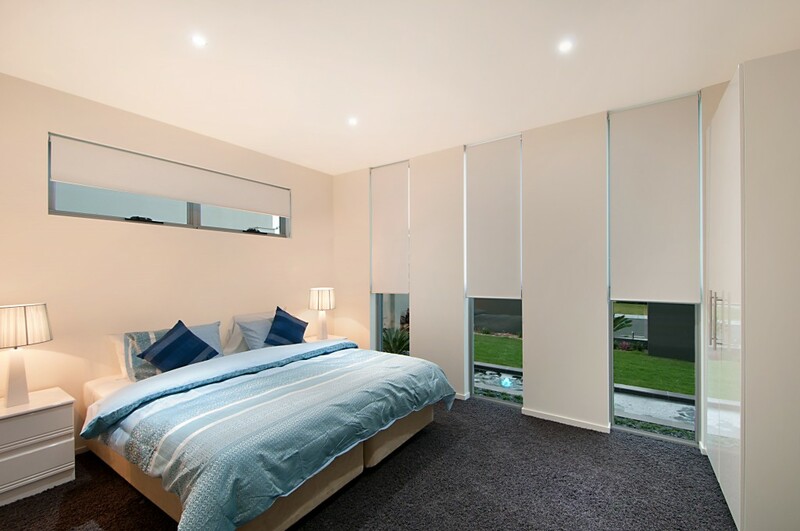 I can highly recommend Elite Homes, such a pleasure to deal with.